Baxter is a cutie! I would love a present like that! Have a great Wednesday Donna! They are both adorable. 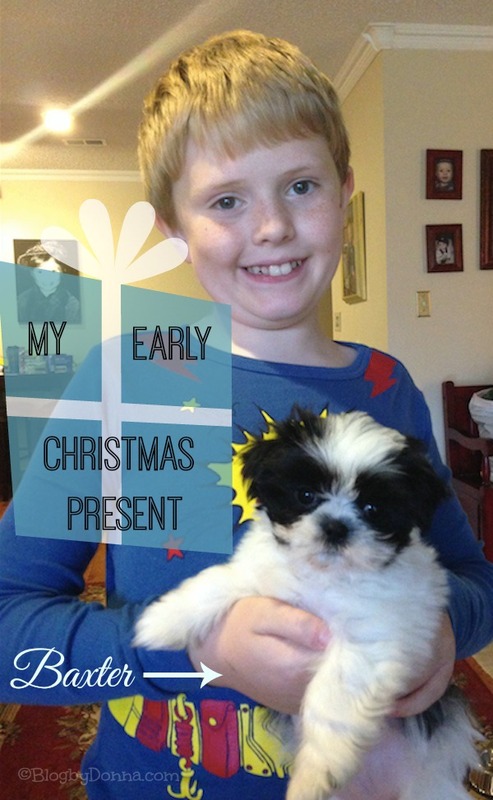 Mu kids want a puppy for Christmas..
That is one very lucky little boy. They are so cute together. Baxter is a cutie pie! Have fun with him they grow so fast!! Awww hi Baxter! I want to snuggle him. Baxter is very cute! Such a great Gift! What a cutie! My aunt has two and they are definitely great little family doggies :-). I hope your son loves his present! Awwwww — he is ADORABLE! I have always wanted a Shih Tzu! Oh my gosh, so so cute! My boys have been dying for a dog and I love this breed. I bet your son is in heaven having a dog. I’ve always wanted a Shih Tzu!! Sooooo cute! Hello Baxter! He’s a cutie pie! So sweet! Our kids would love a little dog like that. Aww how cute is Baxter!!! Ahh! I love Shih Tzus! We have one and love her to death. He is adorable, what a fantastic early Christmas present! He’s so cute, and so fluffy!! Congrats on the new family member! Look at that precious face! Just irresistible! What a wonderful Christmas present. I’m sure Baxter will bring your family many happy memories in the days ahead. So adorable! I love Shih Tzus. Awe, what a great present. He sure is a little ball of fluff. I am sure your son is ecstatic over him. I love the dark eye patches, he reminds me of a little raccoon. Merry Christmas! What an absolutely adorable puppy!! Tooooooooooo cute! I have a major soft spot for Shih-Tzus!!!! I had 2 growing up and they really are the cutest and sweetest dogs around! Awwww congrats on the new addition. Aww, he is so super cute! Congrats on the new addition! Very awesome and your son is such a great kid from all your reports he definitely deserved one. Congrats! Aw, congratulations on your new family addition. I LOVE the name! He is super cute ! How did Baxter handle all the excitement with Christmas? Aww, so sweet! My kids want a dog, but I’m not too sure..
Awww, Baxter is such a cute little doggy. Aaww 🙂 What a cutie and I love his name.